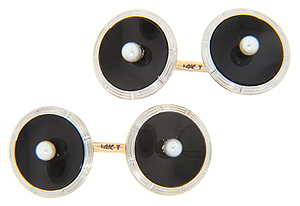 A single pearl set in the center of black onyx which in turn is surrounded by a ring of platinum provides the ornamentation for these antique 14K yellow gold and platinum cuff links. 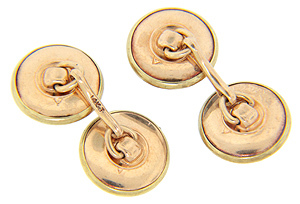 Each link face measures 9/16” in diameter. Circa: 1900.